Meal Notes: This tasty recipe makes a light, tasty lunch. It’s also a perfect potluck contribution, as it pairs beautifully with almost any meal and travels well. On top of that, it forms a flexible base for mixing-and-matching vegetables . Don’t like olives? Leave them out! Need to use up some leftover mushrooms? Roast them in the oven with the peppers and throw them into the salad! Prep: Preheat oven to 400 degrees F. Dice onion, red pepper, and yellow pepper. Slice zucchini into 1 inch, bite-size pieces. Cook Vegetables: Mix onion, bell peppers, and zucchini in a large bowl with 2 tablespoons coconut oil. Season with salt and pepper, then spread on a baking sheet. Roast for about 30 minutes, until tender. Prepare Orzo: In the meantime, prepare orzo according package instructions. 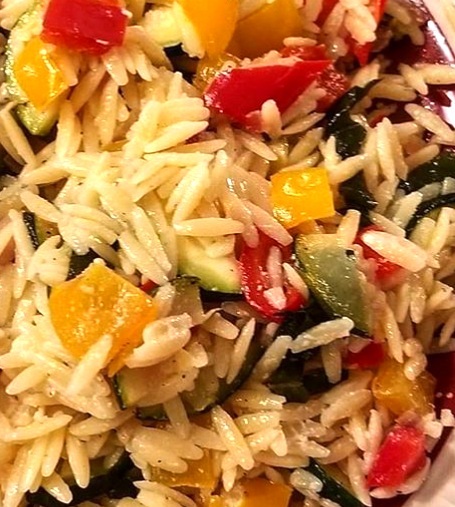 When orzo is al dente, drain in a colander and rinse with cold water. Mix Salad: When vegetables are finished roasting, remove them from the oven and let them cool. Then, return them to the large bowl you used earlier and toss them together with the orzo. Add ricotta, basil, olive oil, lemon juice, salt, and pepper. Mix and serve at room temperature.